Where is Leeds Philatelic Society's Fair held? Will Leeds Philatelic Society be there? Is there parking for cars? There is ample free parking alongside the Hall. Hot and cold refreshments will be available all day on both days. By rail: New Pudsey rail station is nearby. 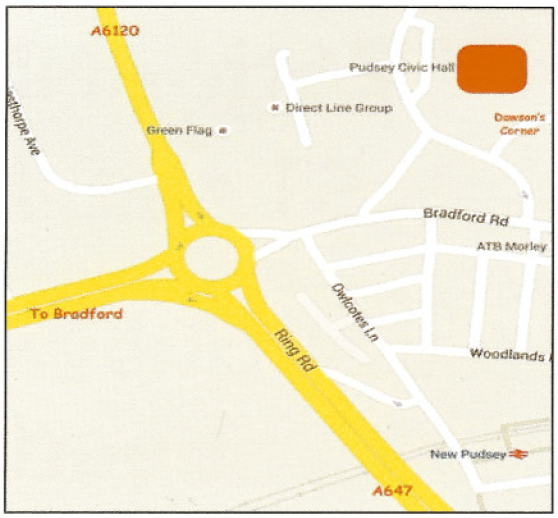 Pudsey Civic Hall is at Dawson's Corner, at the junction of Leeds Ring Road (A6120) and the Leeds/Bradford Road (A647). Drivers coming from the South (M62 Junction 27 & M621) should exit the M621 at Junction 1 and join the Ring Road (A6110 towards Bradford) then via the A647 to Dawson's Corner, ignoring signs to Pudsey. For any further enquiries and for booking a table, then please ring Derek Baron on 01943 465236.